Smoking remains the leading cause of preventable death and disease in the United States. Smoking causes immediate damage to your body, which can lead to long-term health problems. The only proven strategy to protect yourself from harm is to never smoke, and if you do smoke or use tobacco products, to quit. It is never too late to quit, even if you have a lung cancer diagnosis. Studies have shown that quitting smoking can increase the efficacy of treatment while decreasing the risk of complications.There is a wide range of immediate benefits associated with quitting; lowered blood pressure, decreased fatigue and shortness of breath, improved immune response as well as improved self-esteem. It can also have positive impacts on mood, sleep, and appetite. Long term benefits include decreased risk of additional tumors, increased survival time, decreased postoperative complications, improved response to chemotherapy and radiation therapy, and improved quality of life. There are many resources available to help you quit. We encourage you to talk to your healthcare provider about how they can help you stop smoking. Cataldo JK, Dubey S, Prochaska JJ. 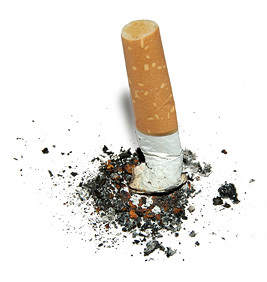 Smoking Cessation: An Integral Part of Lung Cancer Treatment. Oncology. 2010;78(5-6):289-301. doi:10.1159/000319937. Several tools for quitting including a plan builder, texting programs, and tips for dealing with the challenges of quitting and staying smoke free. "Speak to an Expert" connects you to specialists via online chat or phone. Offers free telephone counseling and self-help materials in English, Spanish, Korean, Chinese, and Vietnamese. Special services for pregnant women and smokers with children ages 5 and under. Freedom From Smoking® Online, or FFS Online, is an online smoking cessation program. Work your way through modules, each containing several lessons that provide information to prepare you for Quit Day and support you through your journey. FFS Online can be accessed day or night, seven days a week, on any schedule you choose. The Basic program is free. A paid Premium program is also available. Developed by the American Lung Association. Links to helpful resources, the latest news, research, and therapies for quitting smoking. Provides quitting advice, tips and support specific to women’s needs, including expecting mothers. There are many apps available for your mobile device that can help you quit smoking. Many provide encouragement, help identify your cravings and triggers, and track your progress. The apps we've highlighted here are available for free though some may have premium content that can be purchased in-app. Try out a few to see which works best for you. Log your cravings to identify patterns and get tips on dealing with them. Progress updates show you how how many cigarettes you've avoided, how much money you've saved, and how your health has improved. Optional pro (paid) content offers daily missions to keep you on track. Record cravings and slips by times of day and location. Track your mood and smoking triggers and get tips for dealing with cravings and bad moods. Journal entires help monitor your progress and inspirational messages keep you focused and motivated on your smokefree journey. Quit smoking - QuitNow! - by Fewlaps, S.C.
Track the days/hours/minutes you've been smoke free, the number of cigarettes you've avoided and the money you've saved. Also provides indicators on your health improvement process. QuitNow! is also a social app that allows you to connect with other quitters to chat, share tips and tricks, and support. LIVESTRONG MyQuit Coach by Demand Media, Inc. Create a personalized plan to help you quit smoking. Choose to quit smoking right away or gradually decrease your daily nicotine intake—tracking the times you smoke and have nicotine cravings along the way. Motivational tips and progress charts provide quit smoking help and keep you on track while achievement badges reward you for progress.